Originally a chain of indoor water park resorts, CoCo Key ran into some financial difficulty and sold its properties. The Omaha location is now independently owned and operated. But it retains the CoCo Key name and remains essentially the same. Like the other parks, it is themed to 1930's-era Key West. The water park is comparatively medium sized and doesn't offer some of the more thrilling and, um, splashy, features found at larger parks, such as the water coaster, family raft ride, and bowl ride found at the Chula Vista in Wisconsin Dells. But it does feature a couple of two-person raft slides, a body slide, a lazy river, and an indoor/outdoor spa. 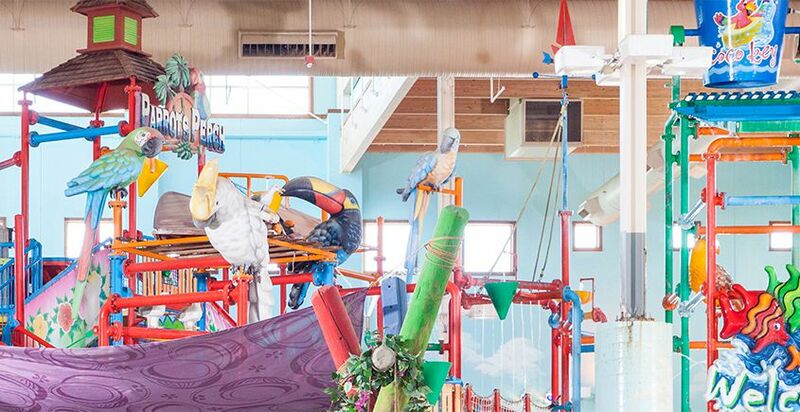 It also has the Parrot's Perch, an interactive water play center with a tipping bucket and small slides. For younger visitors, the park offers "Dip-In Theatre," a shallow pool with a running display of kid-friendly movies. In addition to the indoor water park, CoCo Key includes a video arcade and party rooms. The adjacent Ramada Plaza offers 383 guest rooms, meeting facilities, function rooms, a fitness room, and a restaurant. The water park is open to registered hotel guests who can purchase a water resort package. Day passes are also available to the general public based on availability. I-80 to 72nd Street Exit. Body slides, raft slide, lazy river, wave pool, kiddie slides, indoor/outdoor whirlpool spa, activity pool, and interactive play structure with tipping bucket.